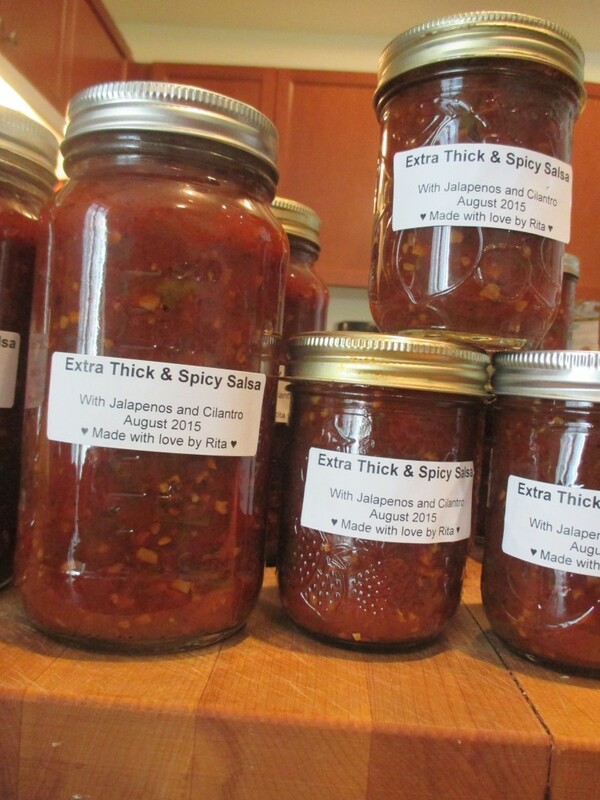 Aunt Rita’s Salsa recipe – and process – you CAN do it! Everyone who lives in Ontario is blessed with the kind of plenty and bounty of which billions of other human beings can only dream…every minute I spend cooking, canning and freezing is a kind of worship for me. I am so grateful to God that I am privileged to live here, in safety, security, and prosperity. We live in the land of Milk and Honey; I hope I always appreciate it and do it justice. I love it when anything I cook makes people happy, but probably the most memorable compliment I ever received was from Sean Burke, a beloved family friend whose father was in the hospital after heart surgery. He sent this question in an email to my brother. I was happy to write him back with my recipe and my process, but mainly I had to point out: it takes time. A really good batch of my salsa takes 3 days. The Hedemark Family is so grateful to the Burke Family for all the generosity they have shown us over the years. One Christmas when Sean’s dad was in the hospital, I passed by their house to drop off a case of the salsa his family loved so much; it seemed the very smallest thing that I could do for them. Here, for the first time, I have actually done a video of my salsa process. Many people will not have the time or the equipment or the patience that it takes to do this kind of job. However, whenever anybody asks me why my salsa is so different – this is the reason. I cook it for 3 days. Usually it works out that I can get it started on Friday, let it bubble away Friday night and Saturday, then pay closest attention as it begins to darken and carmelize on Sunday morning and jar it and process it on Sunday afternoon. While it seems like a long, slow process, in fact the actual work involved is minimal: chopping vegetables at the start which is about 15 minutes’ work. Stirring it throughout – that’s fun, not work. And at the end, getting it into hot jars and processing for 15 minutes: not a huge task.